Port Melbourne Football Club (PMFC) has a proud history spanning 140 years, which makes it one of the oldest sporting clubs in Australia. Completed in 2015, the new facility stands at the edge of the playing pitch, taking advantage of the elevated aspect of the site. This elevation and siting is natural, and allows a corporate, ‘private style’ approach to be incorporated into the design and function of the building that ensures a direct line of sight of the game on the field. The project focus was to deliver a new typology in sporting and community facility design that would enable the cultural and financial success of the club. 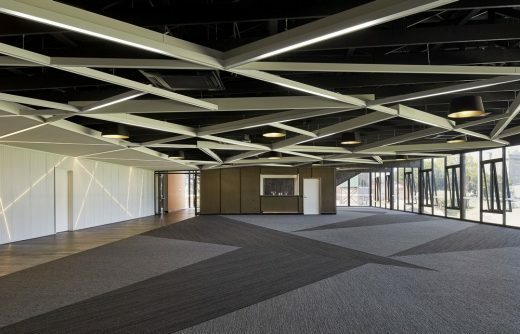 The club required a new 900 square-metre facility to provide a new administration hub, conference and catering facilities however expectations were tempered by the limited available budget, a symptom of Government funding grants. PMFC anticipated the club house would provide little more than a response to their accommodation needs, whereas their hopes were to see the new premises provide them with a facility that could engage with the young and mobile face of Port Melbourne and hopefully enable the club’s membership base to grow and reconnect it with the new community. 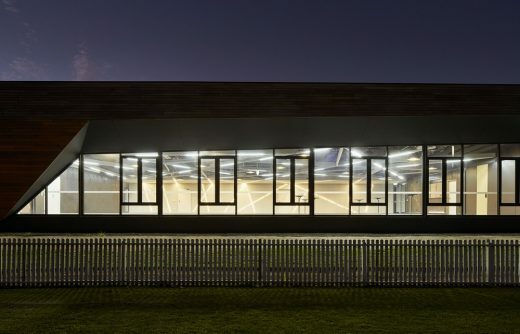 k20 Architecture recognises that sport and design are intrinsically linked and as such aimed to create a facility that would inspire current and future guests not only onto the playing field but also into the club. Since the completion of the new facility Victorian Football League (VFL) major games are now televised on national television from the PMFC ground, with each match attracting larger crowds. The new building has been included in a range of national television advertisements and international cricket games are now played at the grounds. The facility was selected from a nationally recognised industry leader, Peter Rowlands Catering Group, to be part of their suite of Distinctive Venues. 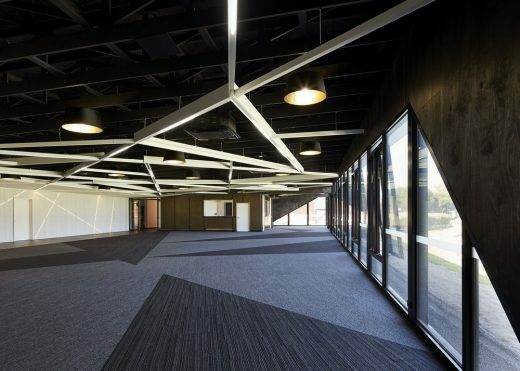 k20 Architecture delivered Port Melbourne Football Club Sporting and Community Facility with maximum specification of Australian and locally sustainable sourced content, including materials and labour, to promote locally sourced and manufactured materials. 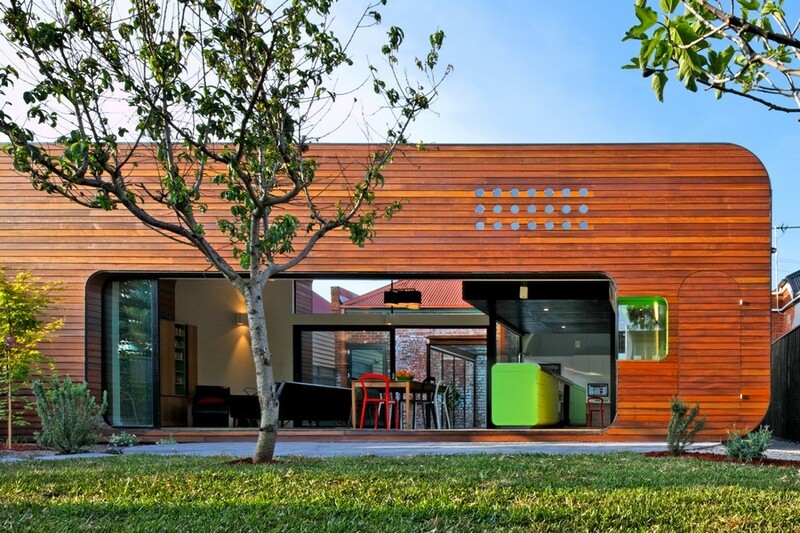 Sustainably sourced timber, with a high carbon sink, was used in the design to provide a cost effective outcome. Standard, off-the-shelf and locally sourced timber materials and timber components were procured and k20 also ensured that local labour was commissioned to skillfully assemble and construct the building. The new facility’s Environmentally Sustainable Design (ESD) initiatives include low energy light fittings, sustainable plywood linings and extensive use of plywood to replace plasterboard. The project incorporated underground rain water tanks for toilet cisterns and landscape irrigation, solar hot water units, exhaust systems with makeup air, low energy and high performing mechanical supply air conditioning systems. The building is also highly insulated, exceeding minimum standards, and includes double-glazed thermally broken glazing systems. The design solution to achieve this high efficiency rate included the use of an open trussed ceiling; an open ceiling grid system incorporating customised lighting that employed ‘off-the-shelf’ items; perforated metal, feature panels that double as acoustic treatments; and material selection preferences locally made from easily obtainable building materials. Sustainably sourced material selections included modular carpet tiles with 90% post-consumer content backing, certified by CRI Green Label Plus and engineered timber flooring with low maintenance and low VOC coating suited to chemical free cleaners. 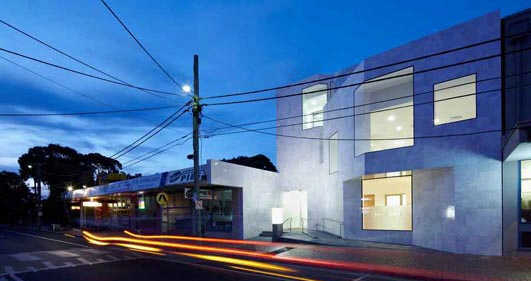 The location of the building was identified based on k20 Architecture’s requirement to retain all healthy trees. Council’s arborists assessed the site to ensure no healthy trees were removed during the construction process and assisted to identify which trees could be removed while work progressed within the tree protection zone. Low-grade contaminated soil on the site was re-used and re-blended to meet clean-fill status. The soil was relocated to other parts of the site thereby diverting landfill impacts concurrently reducing the associated costs of relocating the soil. 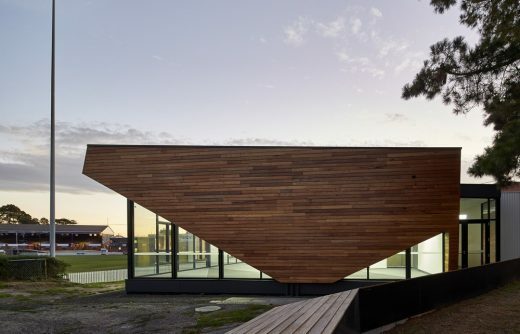 The exterior materiality of the facility is a minimal palette of timber and glass. The ‘V’ form that appears on the East and South elevations was adopted as a subtle reference to the building’s purpose as home to the VFL. This form was used to enable the building to lift and rise, to secure view lines through the building and to connect people with the game. 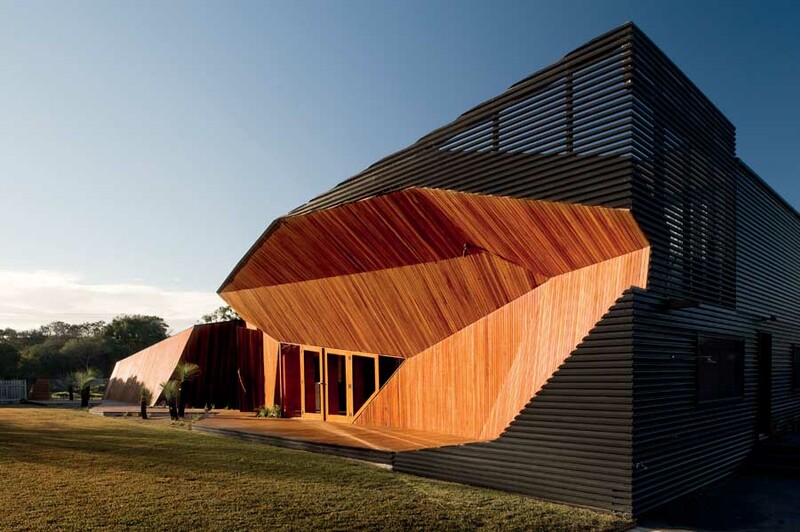 The building provides universal access and a new street presence to the sporting precinct via an accessible timber-cladded pathway that connects to the pavilion entry. The building itself is made up of two parts connected by a pathway that delivers and connects visitors through the building to the sporting precinct beyond. The rear–section of the pavilion reflects the industrious nature of its interior program that includes amenities, kitchen, stores and cool rooms. 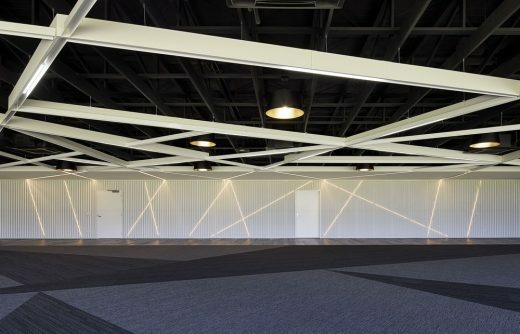 The lighting layout and carpet design are fractal like expressions of paths that travel through the building from various entry points and they echo the paths a player might travel across the playing field during a game of football. 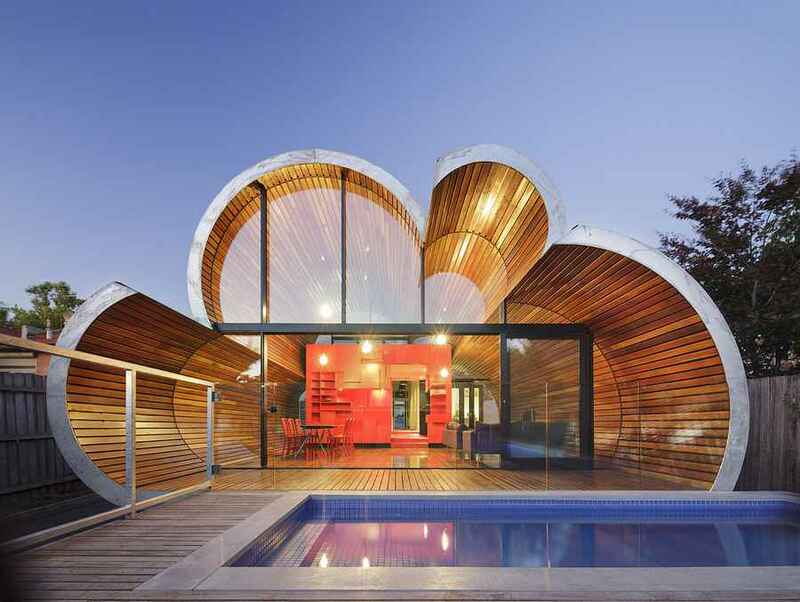 The front section of the pavilion is clad in stringy bark timber and shaped around the internal program of social spaces. 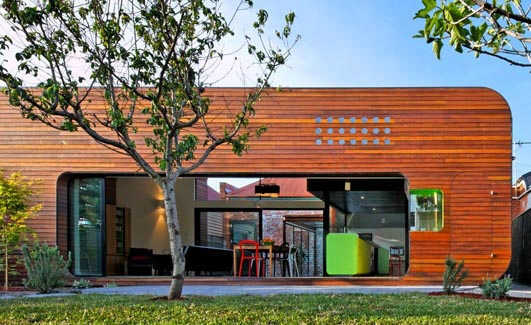 Timber is used throughout the structure and the cladding systems are designed to provide cost effective outcomes using standard readily available and locally sourced materials and components. 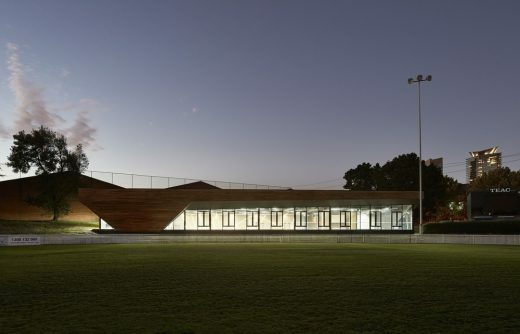 Since the completion of the Port Melbourne Football Club Sporting and Community Facility there have been many positive social, economic and environmental benefits for PMFC and its community. The future is bright with the hope that this important piece of architecture will support the longevity of the club and ensure that it remains relevant for years to come. The club required a new 900 square-metre facility to provide a new administration hub, conference and catering facilities. 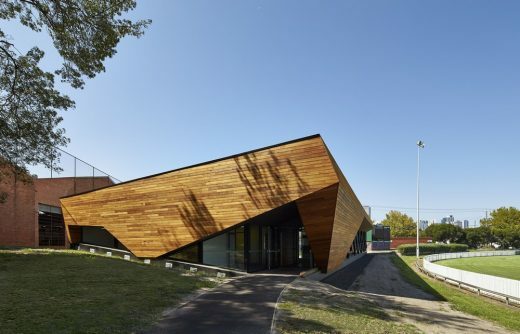 k20 Architecture recognises that sport and design are intrinsically linked and as such aimed to create a facility that would inspire current and future guests not only onto the playing field but also into the club. Since the completion of the new facility Victorian Football League (VFL) major games are now televised on national television from the PMFC ground, with each match attracting larger crowds. The new building has been included in a range of national television advertisements and international cricket games are now played at the grounds. The facility was selected from a nationally recognised industry leader, Peter Rowlands Catering Group, to be part of their suite of Distinctive Venues. 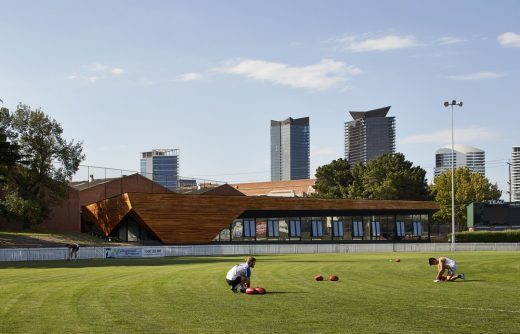 More VFL finals are selectively played at the ground, which did not occur prior to the completion of the new club house. Integrated within the building’s core DNA is sustainability. k20 Architecture developed mechanisms to reduce energy consumption within the program of the building, and designed a structural system that could remain exposed forming the interior and exterior skin of the building. 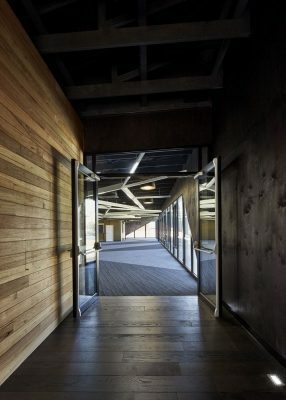 The building’s bracing walls are framed in structural plywood and are left in a natural state, having only been sanded and stained black. With the extent of the glass required for optimal viewing of the game k20 Architecture weighed in on balancing the costs of the glazing system, the specification of the a/c solution and energy consumption. The adopted method was to have the building naturally ventilated whilst working alongside Pilkington to develop a unique double glazed thermally broken glazing solution for the building. The building is also highly insulated, exceeding minimum standards and includes double-glazed thermally broken glazing systems. The design solution around this high efficiency rate included the use of an open trussed ceiling, open ceiling grid system incorporating customised lighting using off the shelf items, perforated metal feature panels that double as acoustic treatments and material selection preferences locally made by off the shelf building materials. Sustainably sourced material selections included modular carpet tiles with 90% post-consumer content backing, certified by CRI Green Label Plus. Engineered timber flooring with low maintenance and low VOC coating suited to chemical free cleaners were also adopted. 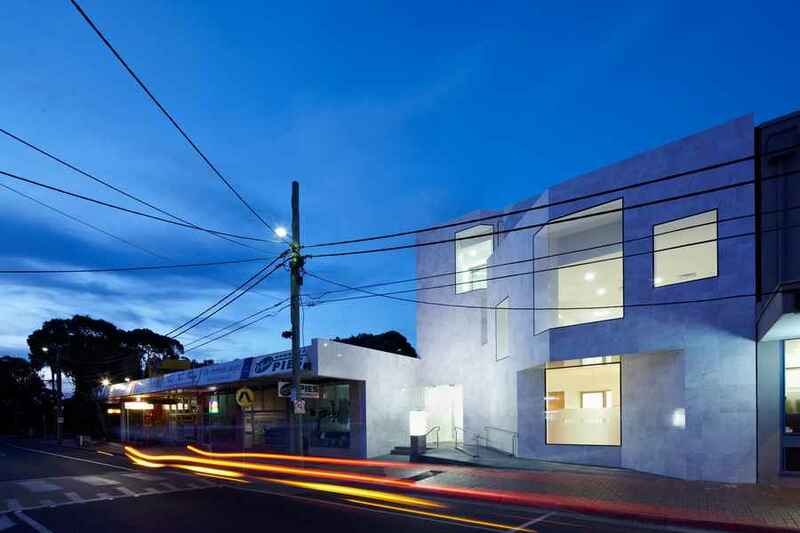 The project was designed around the retention of all healthy trees and those trees which were assessed as unhealthy by Council’s Arborist where removed to make way for the building. Each tree in turn was replaced with 7 new trees that were planted across the site. Contaminated soil on the site was re-used and re-blended to clean fill status. The soil was relocated to other parts of the site thereby diverting landfill impacts whilst reducing the associated costs of relocating soil as contaminated soil.